Intelligentsia has been part of my journey towards speciality coffee, long before the Coffee Spot came to be. In particular, I’ve been a semi-regular visitor to the Intelligentsia in the Monadnock Building, on Jackson Boulevard. Having written about it on my previous visit to Chicago last summer, I thought it was about time I visited another branch. Ideally, it would have been the original Intelligentsia in Lake View, but fate had other plans, so instead I found myself a few blocks away from the Old Town branch. This is a relatively new addition to the Intelligentsia stable, having opened in 2013, the fifth of six Chicago branches. It was also the first Intelligentsia to share premises with another business, a model that was followed with the High Line Hotel in NYC. In the case of the Old Town branch, it shares with plum market, an upmarket grocery store which occupies the north end of the space, Intelligentsia tagged on at the southern end, a long, table-lined corridor connecting the two. As well as the usual Intelligentsia offering of espresso-based drinks, bulk-brew and pour-over, you can get food from plum market and bring it over to eat with your coffee. The Old Town Intelligentsia is very different from the downtown branch in the Monadnock Building, both in terms of the space and in its look and feel. While the downtown branch is dominated by takeaway customers, Old Town has a much more sit-in feel, with laptops on almost every table (guilty as charged). It’s a big, modern, open L-shaped space, with the top of the L forming the corridor linking Intelligentsia to plum market to the north. You can, if you wish, come in that way, or you can use Intelligentsia’s own entrance direct from the street, where you have a choice of a revolving door or, to its left, a more conventional one. Whichever you choose, you’ll pitch up in the corner of the L, with the counter dead ahead. In keeping with the L-shaped theme, this too is L-shaped, the bottom of the L facing the door, the long-side running parallel with the right-hand wall. Between you and the counter is a merchandising table, with more merchandising on the wall to your right. When it comes to seating, two/three-person round tables line the windows along the corridor to your left, looking out onto North Wells. An L-shaped wine-bar sits on the opposite side of the corridor, where you can perch on one of four or five bar stools. Talking of perching, pull up a chair and perch at the far end of the counter, where you’ll have a prime view of the brew-bar. There’s also a small, round table immediately to the right of the door, ideal if you need a secluded spot. However, the bulk of the seating is in the bottom part of the L, between the counter and the left-hand wall. Some four-person tables project from the wall itself, while a handful of round tables are scattered around in the remaining space. It’s very bright and open, with high ceilings, the sense of space helped by the long side of the L, running down North Wells, being entirely glass from floor-to-ceiling. West-facing, it’s well shaded from the sun, even in the afternoon, both by the tall buildings across the street and by a row of trees planted on the edge of the sidewalk. Turning to the coffee, the gleaming white La Marzocco Strada faces you as you enter, taking up much of the front of the counter. The till is sandwiched between the Strada and the cake cabinet, which has a range of locally-baked goodies. Meanwhile, the coffee menu is located to the right of the espresso machine, next to the grinders. There’s the usual Intelligentsia coffee-offerings, starting with the espresso-based drinks. There’s the seasonal Black Cat blend, the staple of all Intelligentsias. This is backed up by the Fruit Bat seasonal blend and, of course, decaf. You have a choice of single-origin filters: one on bulk-brew and three more as pour-overs, plus another blend on cold brew. During my visit, an El Salvador was on bulk-brew, two Ethiopians on the Chemex and a Kenyan on the Café Solo, a cafetiere-like brew method. There’s also a selection of nine loose-leaf teas and various Matcha and Chai Tea options. For old time’s sake, I had a shot of the Black Cat. 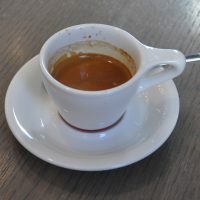 Full-bodied and fruity, it became more rounded with the each successive sip, a lovely espresso. This entry was posted in Cafe/Roaster, Cake, Chicago, Coffee Shops, Evening Opening, Laptop Friendly, Retailers, Shops and tagged include by Brian Williams. Bookmark the permalink. I really like the idea of collaborating with other businesses.. I’ve visited a couple in New York and offering more than coffee makes sense.